yesterday I took my 93-year-old to the dentist, and walked over to the Fred Meyer nearby to wait. 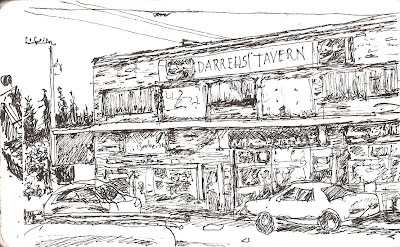 lo and behold, they have a coffeeshop looking over at Darrells Tavern, and none of the regular customers even took the window tables! A sketcher's dream come true. Nice sketch, Beth! Ahhhh, invisibility: a sketchbook and pen in hand and others complete disinterest in what a sketcher finds fascinating. The best! !